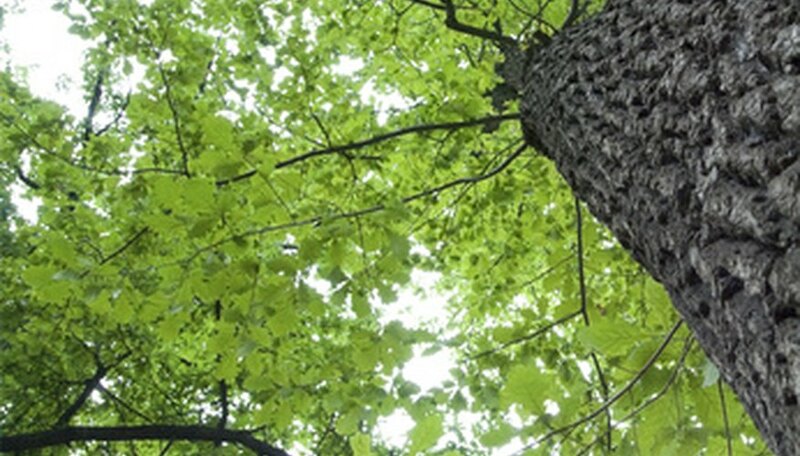 Gardeners in Kentucky can choose from a variety of oak trees. Distinguishing features include leaves, size, shape and acorns. Oak trees have both male and female flowers. The male flowers grow in long clusters and can be messy when they fall--something to consider when placing the tree. Placed appropriately, the tree will provide shade for people and plants, and food for the local squirrel population. Pin oak (Quercus palustris) is native to the eastern United States. The tree has a pyramid shape when young and becomes oval as it grows to 100 feet tall and 40 feet wide. The tree produces medium or dark green leaves that grow up to 5 inches long with three to seven thin lobes and turn red-brown to russet in the fall. Leaves remain on the tree through the winter on young trees, but drop off in the fall on older ones. Acorns measure 1/4 inch long, grow in clusters of two or three and remain on the tree for two years. In Kentucky, plant pin oak in full sun and a soil that is moist to wet. Chestnut oak (Quercus prinus), also known as basket oak, is native to the eastern United States and likes full sun and a moist, well-drained soil. The tree grows from 60 to 70 feet tall with a round canopy at maturity. Dark yellow-green leaves measure 4 to 8 inches long with a coarsely-toothed margin, and turn yellow-brown in the fall. Dark-brown acorns grow from 1 to 1 1/4 inches long. Plant chestnut oak in full sun and a moist, well-drained soil. Willow oak (Quercus phellos) is another east coast native that grows well in Kentucky. The tree’s outstanding feature is the dark-green, lance-shaped, willow-like leaves that grow from 2 to 5 inches long and turn a bronze-red color in the fall. Willow oak grows from 50 to 70 feet tall. Acorns are ½ inch long and stay on the tree for two years. Plant willow oak in full sun and a moist, well-drained soil. Shingle oak (Quercus imbricaria) is also known as laurel oak. Commonly found in Kentucky, the tree grows from 50 to 75 feet tall with an oval, round or gum-drop shaped crown at maturity. Dark green leaves grow from 3 to 6 inches long and 1 to 1 1/2 inches wide and turn yellow-brown in the fall. Acorns grow less than 1 inch long and stay on the tree for two years. Plant shingle oak in full sun and a soil that is moist and well-drained.